This entry was posted in Τεχνολογία and tagged microsoft, Windows on 08/12/2007 by nikan. 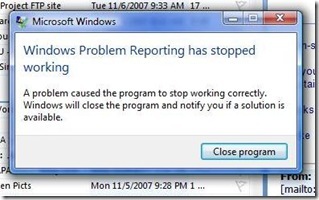 Microsoft Windows Vista’s Windows Problem Reporting app is reporting that it has a problem and can no longer report. 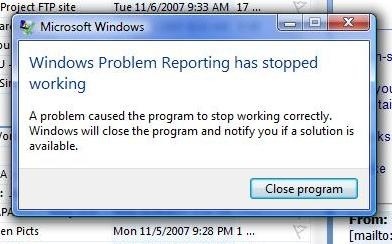 However, it will report in the future if there is a fix to the problem that is preventing it from reporting, that will allow it to once again report. @Oneiros Δεν το ξέρω αυτό με το ρουφιάνο.